The SportRaxx rack for trucks is designed to cover the front half of your truck bed and utilize existing stake pockets for no drill mounting. This truck rack fits perfect on 8 ft truck beds but can be used on any size truck bed. See details and free shipping info below. The Sportraxx XL multi-sport truck rack is designed to cover the full length of your truck bed. It is usually used on short bed trucks (less than 8ft) with stake pockets in the front and rear corners only. See details and free shipping info below. The SportRaxx RL is designed specifically for the Honda Ridgeline. It's designed to use your existing truck bed, tie down mounting points to maximize your gear carrying ability without drilling or comprimising access to your trunk. See details and free shipping info below. Check out our photo gallery for more truck photos! The SportRaxx, SportRaxx XL and SportRaxx RL are the foundation of the SportRaxx by Simpson truck rack system. All of our other products attach to and require these base racks. Our SportRaxx multi-sport truck racks are built to fit each different make and model truck. They have a custom look and feel to them without a custom price. They are stylish, functional and so easy to use you’ll find yourself playing outdoors more often. 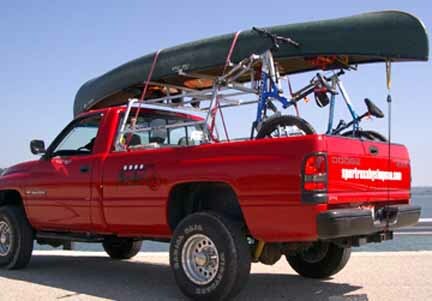 The SportRaxx multi-sport truck racks can be used on any size truck to carry all of your outdoor sports gear. Our truck racks are made of long lasting, rust resistant aluminum, unpainted, so that nicks and scratches (they happen) won't show. Easy installation takes only a few minutes. Our racks for trucks ship complete with all mounting hardware. SportRaxx and SportRaxx XL multi-sport truck racks easily mount to the stake pockets using our system of anchor bolts. Our anchor bolt system is stronger than clamps and installs in minutes. Don't have stake pockets? You will need to drill holes in your bed rail to use this rack. If you need to remove the rack for any reason, you can put the anchor bolt back in place in the bed rail and no one will ever see the holes. SportRaxx RL is designed to use your Honda Ridgeline factory tie down mounts. Simply remove the bolts holding the brackets in place, place the rack on the mounts and put the new longer bolts back in the brackets to secure your truck rack in place. Your rack will be out of the box and ready to use in less than one half hour. Rack is easily removed from truck in minutes and disassembles for easy storage in your garage or shed. But it looks so good you may never want to take it off. Optional sport racks to use with your SportRaxx multi-sport truck rack system include: Bike Raxx (bike racks), Canoe Raxx (canoe racks), Kayak Raxx (kayak racks), Kayak Cradles, River Runner Raxx (two canoe or multiple kayak rack), Ski Raxx (ski racks), Snowboard Raxx (snowboard racks), Safari Cargo Basket, Safari Light Bar and more! SportRaxx has the most complete line of racks for trucks. Because SportRaxx multi-sport truck racks mount to the truck bed only there is no need to worry about your boats being twisted or stressed as the truck cab and bed move about independently during travel. Not sure how long you'll keep your truck? 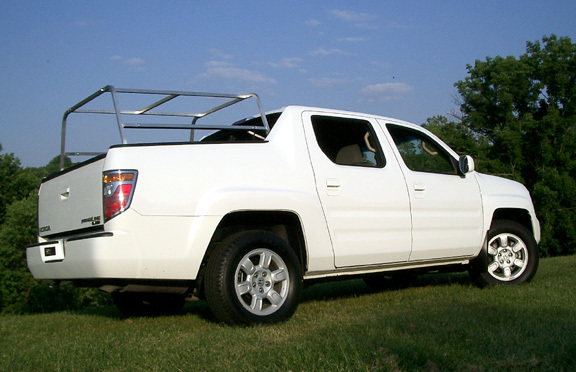 SportRaxx racks for trucks can often be converted to other size truck racks by purchasing a conversion kit. Contact our engineer for specifics. SportRaxx by Simpson multi-sport racks for trucks are manufactured in the USA and come with a one year manufacturer's warranty. Shipping is FREE in the continental US when ordering SportRaxx truck racks.. If you're still unsure which product is right for you, call us and talk to our engineer. We promise no sales pressure, just information. To order a Sportraxx for your truck call us at 513-617-7575. SportRaxx has a 2 Step Process to outfitting your truck. Step 2) Add the sport specific racks needed to carry your gear.